How much do things cost in Budapest Hungary? Here are some quick approximate prices of drinks, meals, tickets, etc. in Budapest. How much are Grocery prices? 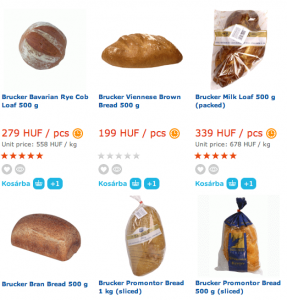 For an up to date and very detailed reference you may try to use the website of a Budapest grocery webshop called G Roby (these prices are more or less average market prices, Tesco, Liddle, Auchan etc. prices tend to be cheaper). How Much are Foods and Drinks in Bars and Pubs? Beer: 2-5 euros in pubs, 1-2 euro in grocery shops. Wine: 2-8 euros per glass (2 dl) in restaurants and bars. Wines by the bottle in shops: 3-40 euros. Coffee: 1.5-4 euros in cafes. How Much are Meals and Drinks in Restaurants and Diners? Dinners in non-touristy restaurans (e.g. a 3 course salad/ soup – main course – dessert) 12-20 euros. These are not Budapest Michelin restaurant prices of course. Take away menus (e.g. Burger King, McDonald’s) cost about 2-5 euros. Average Subway sandwich prices: 3-4 euros. Touristy or upscale restaurant meals (3 courses) 20-60 euros. How much are tickets in Budapest Baths? Bath tickets: 12-21 euros. Read more about Budapest Baths prices. How much are Public Transport tickets in Budapest? Bus – metro – tram tickets: 1.2 euro. Read more about Budapest Metro, Bus, Tram Ticket prices. How much are general entrance fees in Budapest? Museum tickets: typically range between 5-15 euros. Wifi per hour: 1-4 euro, but several places has free wifi access. Hotel rooms: averaging around 65 euros. Hostel rooms: approx. 20-30 euros. Please help us keep updated and informative. If there are any changes in the above, or you have any remarks, complaints, compliments regarding Prices and Costs of Living in Budapest, Hungary, please send your comment in below.